Aki was very vocal on how much he liked the scent of the Mahogany Teakwood wallflower refill fragrance. And, you know it's monumental when a man takes note of those kind of things. Ergo, I though I'd surprise him in the shower with the Mahogany Teakwood Shower Gel. Top Notes: Mahogany, Delicate Lavender. Mid Notes: Teakwood, Geranium, Oakmoss. Dry Notes: White Cedar, Feathered Musk. 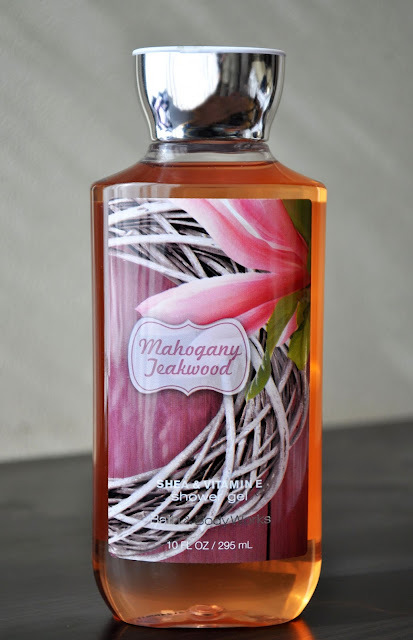 The interweaving of the different wood notes, lavender, geranium, oakmoss, and musk, give Mahogany Teakwood a sensual, cozy, crisp, woodsy scent that is enhanced by a chilly November breeze. There is a masculine element to this shower gel that may not be to everyone's liking; but, I'm keen on masculine scents (and, sometimes wear men's fragrances myself).